In case you missed it, the cost of a college education is increasing dramatically. Public and private colleges alike are increasing tuition significantly, many because of state budget cuts. This has left many high school seniors in a bind. For years they have heard the media, their parents, their teachers and counselors say the best way to get a decent job with good pay is to earn a college degree. But now they wonder how they can afford it. The Institute for College Access and Success’ Project on Student Debt conducted a recent survey that gives us insight into how students are paying for a college education. The results are astonishing and scary. 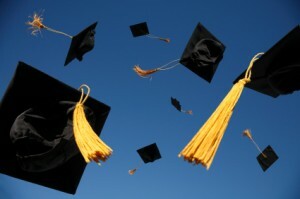 Two-thirds of the class of 2011 held student loans upon graduation. The above figure is up 5% from 2010. The unemployment rate for college graduates was 8.8% for 2011. 64 colleges in the study said more than 90% of their seniors graduated with debt. College debt will put you in a financial prison. You may spend decades there. And when you are in prison because you owe somebody something, you won’t get out until you have paid the very last penny. help our children think creatively about how to pay for school. We can’t afford to let our children start their adult lives – post-college – in a financial prison. What is a creative way your child has paid for school? So true! I was mystified when each of my three kids, while deciding on college, asked about debt with an attitude “of course, we’re taking out a student loan.” I was gobsmacked. Had I failed in my financial child rearing? I responded with “Why don’t we first talk about how much we can afford and what fits our budget.” I have a 0 student loan policy. If they want to go to an expensive school, they can work, take longer to graduate, start at community college, find scholarships, a myriad of better choices over starting their life in debt. I like your policy Tara. And I’m not surprised by the statement from your kids. From all my years working in education I’ve heard this over and over from HS juniors and seniors. It’s become a given in their minds to borrow without even really thinking about the consequences of those actions.